Seven FVAD students have received School of Alberta Ballet Summer 2017 invitations! On Sunday, October 30, FVAD students travelled into Vancouver to the Scotiabank Dance Centre for the School of Alberta Ballet Summer 2017 auditions. 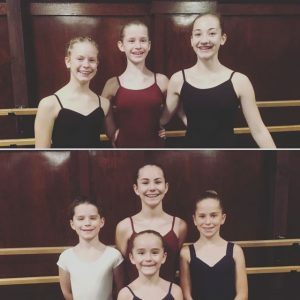 These are the first-level auditions for their professional division which provides full-time training for students in academic grades 5 and above. Within a few days, seven excited students had received their invitations having been successful in their auditions. With six other students being accepted already to the Royal Winnipeg Ballet School Summer 2017 (and one on the waitlist), the high level of training being provided at the Fraser Valley Academy of Dance is clearly being validated by these ballet company schools. Previous Post: Dance as Sport or Performing Art?